The Loyalist Volunteer Force has said its conflict with the Ulster Volunteer Force and Red Hand Commando has ended. In a statement issued to the BBC on Friday evening, the LVF called for mechanisms to be put in place to prevent any further feuding among loyalists. It had emerged that the LVF's offer to suspend attacks at 1200 BST on Wednesday remained in place, even though the UVF refused to reciprocate. Just hours after the offer was made through intermediaries, the Ulster Volunteer Force carried out an attack on a house in the east of the city. Progressive Unionist leader David Ervine welcomed the statement on Saturday and praised all those who had worked to bring the feud to an end. "I think that the UVF's position will be one of a watching brief," he said. "They will judge by actions or lack of actions rather than by words. "But that should allow us all in this community to get on with the life that we have to live and it seems to me that the feud as it has been described in the media is over." He added that he hoped there would be no further infighting among loyalists. BBC Northern Ireland security editor Brian Rowan said: "This latest feud was sparked by a number of incidents in Ballybeen a fortnight ago when houses were shot at and a pipe bomb thrown. "The LVF was blamed, but in its statement the terrorist group said it did not authorise or sanction those attacks. "The statement refers to an inquiry in line with what the organisation calls its 'disciplinary procedures'. "Sources suggest the LVF will disarm and disband those who sparked the latest infighting." One person has been murdered, several homes bombed and families have been moved out of their homes during the latest feud. Since the murder of the LVF member Brian Stewart last week, there have been several incidents. The bulk of these have been linked to the UVF, but two attacks on Tuesday were carried out by the smaller LVF. In its statement, the LVF described Mr Stewart as "a completely innocent victim". It said no other loyalist should die at the hands of other loyalists and said mechanisms should be put in place to prevent any other feuding. 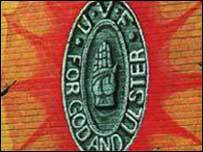 The LVF said its conflict with the UVF, Red Hand Commando and Progressive Unionist Party had now ended. Earlier on Friday, Ulster Unionists in east Belfast met senior police officers to discuss violence linked to the loyalist paramilitary feud. It came amid claims that attendance at schools in the area is down and pubs are closing early because of the dispute. After the 90-minute meeting, UUP councillor Jim Rodgers said the police had very good intelligence on those involved in the feud. "If they want to keep out of prison they should stop immediately because the security forces are going to catch up with them," he said. Assistant Chief Constable Duncan McCausland said: "It was a very positive and constructive meeting during which were discussed a number of issues. Further meetings will take place in the future. "The police are committed to meeting all groups willing to hold discussions towards a safer community." "A permanent end to the violence may hinge on whether the LVF is true to its words"